It was announced this month that Jupiter has got even more moons than previously thought, with its total haul now coming in at 79! We discuss why the new moons are odd. The Very Large Telescope in Chile also made a new discovery – a very young planet forming in the dusty disk of material around its star. And back here on Earth, the MeerKAT radio telescope has been inaugurated in South Africa, producing a new image of the centre of our galaxy and making important progress towards the eventual goal Square Kilometre Array, which will be spread across Southern Africa and Australia.. 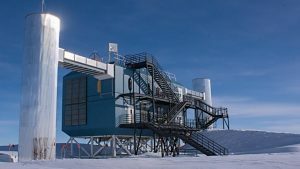 But there was a more unusual announcement this month from the IceCube neutrino observatory, which is sensitive to ghostly subatomic particles called neutrinos. At the end of last year, the team worked with “traditional” astronomers, i.e. those looking at light of various wavelengths, to identify a neutrino that originated from a blazar – material surrounding a supermassive black hole in the centre of a galaxy. Since this takes us in to the realm of particle physics, I spoke to Dr Ben Still, honorary researcher at Queen Mary University London and author of “Particle Physics Brick by Brick“, in order to find out more about neutrinos, how we detect them, and what we can learn from them. An extended edition of an original broadcast on 25th July 2018 as part of Pythagoras’ Trousers on Radio Cardiff.